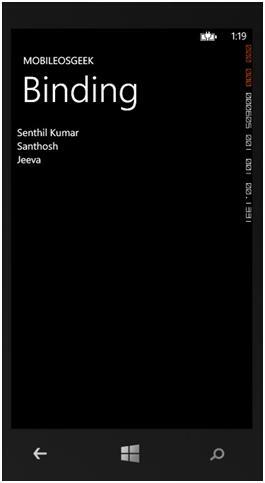 The ItemsControl in Windows Phone has the ItemsSource property which can be assigned a collection such as Lists or Arrays . This example demonstrates how to bind the collection to the ItemsSource property of the ItemsControl and display the items in the page. 1. Let’s assume that we have the Employee class which needs to be utilized for displaying it on the UI. 2. Lets add the ItemsControl component to the UI / XAML page and specify the DisplayMemberPath (property) which needs to displayed on the UI in ItemsControl item. 3. The final step is to create the employee collection and then assign it to the ItemsSource property of the ItemsControl as shown below. 4. Run the Project in Windows Phone Emulator by hitting the f5 key . You should be able to see the list of employee in the application as shown below.